The tissue story in the former Soviet republic emerged after independence in 1991, and is marked by headline percentage growth figures – 30- 51 – 54%. But increased disposable incomes, product familiarity, modern retailing and distribution, devaluation of the local currency and a local entrepreneurial spirit all point to a deeper resurgence. 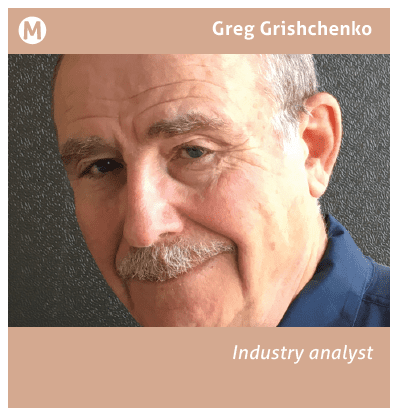 Industry insider Greg Grishchenko reports. There is a local legend about Georgia. When the Almighty distributed land among peoples after creation of the world, he forgot about Georgians. When reminded about such mistake he decided to give Georgians something from his private stock which he kept for himself. This country of fascinating beauty with a population of 3.8m reveals incredible landscapes from subtropical sea beaches in the East to ski resorts in the Central region and Alazani Valley vineyards in the West. Georgia’s mountainous area of about 69,000 square kilometres between the Black and Caspian Seas had been a crossroad between cultures of West and East for hundreds of years. Proximity to the Great Silk Road, Persia, Russian and Ottoman Empires defined the country’s destiny not only as a great trading place but also a site of bloody wars. Georgia has always been rich in water and natural resources and during its Soviet period produced a range of industrial products coming from large steel mill in Rustavi, advanced truck plant in Kutaisi and manganese mining complex in Chiatura. The breakdown of the Soviet Union almost wiped out established industries that never recovered. Later on, going from bad to worse Georgia lost nearly 18% of its territory in the wars with separatists in Abkhazia and South Ossetia. to the country. After his demise, the country continues to gradually improve economic climate while keeping stable relationship with all neighbours. product familiarity and rise of modern distribution channels all helped to intensify tissue consumption. In addition, the devaluation of the local currency, lari, in 2014, supported growth. all tissue categories. Only twenty years ago same kitchen towels as household staple was meant to be made of cloth and going to a washer. With the absence of major local integrated tissue producers Georgian market dynamics are driven by two key factors: imports of finished product from big players and local tissue converting companies relying on imported jumbo rolls. Sharing a common border with Turkey, one of the world’s leaders in tissue manufacturing, helps a lot. Indeed, Ipek Kagit with its wide product portfolio was the leader in Georgian tissue sales in 2017 keeping presence in almost all regions of the country and supporting uninterrupted product flow in both traditional and emerging retail conduits. Eczacıbaşı Consumer Products (formerly Ipek Kagit) is strong in marketing of its most popular brands Selpak and Solo comes from advantageous price-to-quality ratio supported with advertising. Number two in retail tissue sales, Kyivsky Kartonno-Paperovy Kombinat from Ukraine, is a manufacturer and distributor of Obukhiv brand toilet paper that falls into coreless economy category made of recycled fibre. 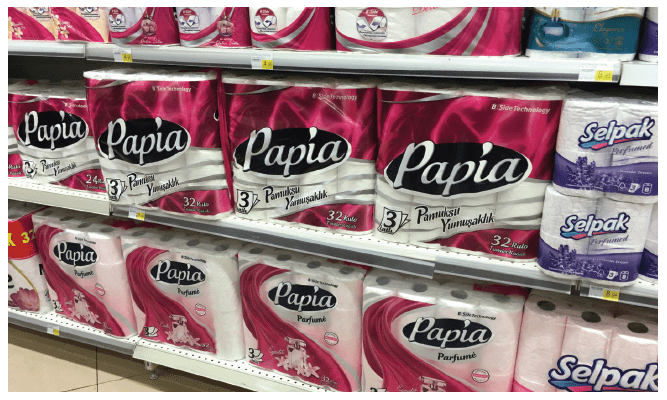 Hayat Kimya, another Turkish key paper supplier promotes its brand Papia with compelling advertising commercials and recurrent discounting campaigns offering lower price than Eczacıbaşı Consumer Products in premium category. While disposable incomes of significant numbers of the population in Georgia remain low, tissue product price, such as toilet paper, plays important part in household budget planning. With the absence of low cost private labels only recycled retail tissue satisfies demand for a cheap product. That is why the fastest growing area within retail tissue in 2017 was recycled toilet paper made by local manufacturers. Most of about a dozen companies in this area are quite small, with limited capital. With the growth of modern retailer chains such companies may be pushed to traditional groceries who are less concerned with financial strength expected from suppliers. 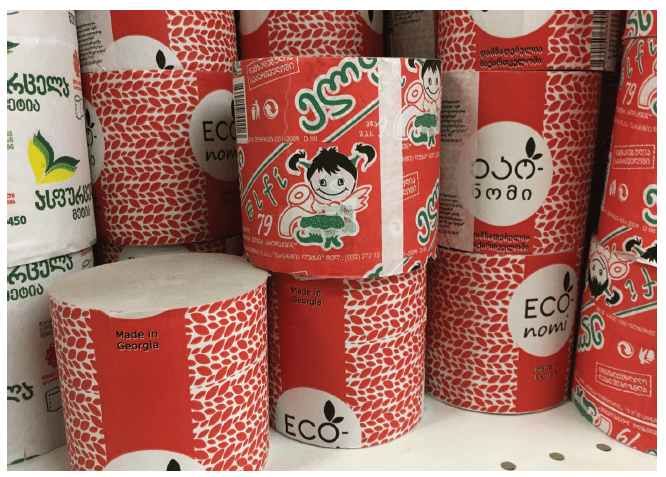 Despite that recycled toilet paper is a quite small sales category, the local company, Georgian Paper Production has become a major player, ranking third in overall retail tissue sales in 2017. In 2017 according to Euromonitor International, 56.7% of the country’s $26.2m tissue retail sales are bathroom tissue, with other principal tissue products like paper towels and facial tissues making 18.2% and 18.5% respectively. Annual per capita tissue consumption in Georgia is about 5.3kg. Around a half of tissue imports to the country come in the form of high quality toilet paper, kitchen towels and other tissue categories. Incontinence goods are exclusively imported from multinationals such as Procter & Gamble, Kimberly-Clark and Essity and took $45.4m in 2017 sales. 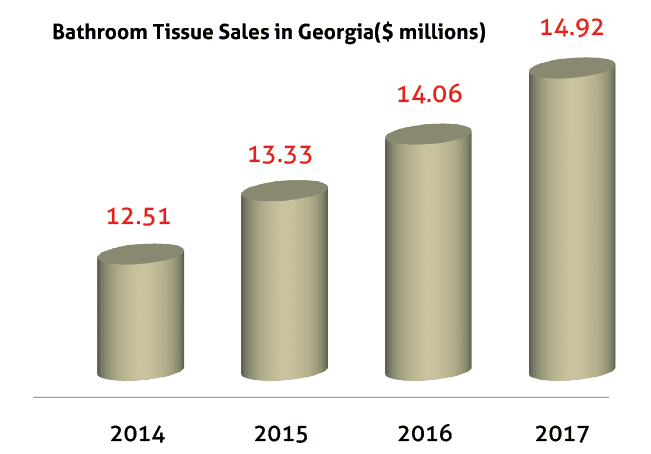 Distribution of tissue goods is trailing overall retail trends in Georgia. Sales generated in traditional grocery retailers, mainly street corner independent groceries are gradually declining due to the expansion of modern grocery retailers, primarily supermarkets and hypermarkets. The percentage of Georgians who prefer big supermarket chain shopping over still popular open air markets and small groceries is gradually growing. According to Euromonitor International, supermarket shopping in the country grew from 12.4% in 2012 to 15.6% in 2017 while sales in independent non-chain groceries declined from 41.2% in 2012 to 31.6% in 2017. While local grocery retailers in Georgia started to open modern style supermarkets in the early 2000s, it took a decade for major international chains to step in. Currently only in Tbilisi there are four Carrefour (headquartered in France) and six Dutch affiliated SPAR supermarkets in addition to several Georgian and Turkish chains (Foodmart, Smart, Goodwill, Nikora, Tursa). Major chain supermarkets offer a wide range of toilet paper, kitchen towels and napkins from premium brand suppliers to various economy goods both imported and locally made, attracting customers with lower price promotions in dedicated store areas or special isles with jumbo packs on sale. Entrepreneurial spirit in Georgia during hard times helped to create local “buy or make” economics in consumer tissue. Currently there is a group of nearly a dozen small local tissue product manufacturers with annual capacity from 2,000 to 5,000 tonnes converting imported jumbo rolls into finished product. One of the local leading manufacturers, Kriala (Tissue Paper), a part of Georgian holding Palitra Media, was established in 2014 in Tbilisi and employs 85 people. The company invested nearly $5m to become full cycle integrated tissue producer and reportedly makes own tissue from recovered fibre on its own Chinese made tissue former with the capacity up to 5 tonnes per day. Kriala also converts 100% virgin fibre jumbo rolls from Turkey. The company’s product range includes premium 2-ply and 3-ply bathroom tissue, kitchen towels and napkins under variety of brand names like Kriala, Fafuki and Eco. The company also makes economy coreless toilet paper brand Asfurtsela and a range of virgin and recycled stock tissue products for AfH market including jumbo toilet rolls and Z-fold napkins for industrial dispensers. Since its opening the company announced two major operational goals: ecological awareness and replacement of imported tissue products with local produce setting the aim to satisfy 30% of Georgian consumer tissue market. Currently, despite difficulties with secondary fibre collection in the country Tissue Paper makes an effort to “go green” running “Green Holidays” promotion in partnership with CENN (Caucasus Environmental Non- Governmental Organization Network ) offering cash prizes and new books for public schools participating in waste paper collection during school holidays. Simetra, located in Tbilisi, is the number two retail tissue and toilet paper producer in the country. The company is privately owned, employs nearly 60 and reported sales revenue of about $1 million in 2017 which is nearly 4% of Georgian retail tissue market. Wide variety: major supermarket chains offer a range of tissue products from premium brand suppliers to various economy goods, both imported and locally made, attracting customers with lower price promotions in dedicated store areas or special isles with jumbo packs on sale. With its own brand Orei the company is present in toilet paper, kitchen towels and napkins in retail and AfH segments. The company also makes disposable bed liner for medical offices. Simetra converts exclusively virgin stock from Turkish suppliers and have significant presence in major Georgian supermarket chains. In addition to manufacturing of premium tissue products Simetra runs Orei Distribution Network providing tissue product delivery using own trucks to supermarkets and AfH/HoReCa organisations. Speaking about future plans, Beqa Sikharulidze, chief executive of Simetra, says the company’s main goal is to establish the competitive presence in the Georgian premium tissue market. “We capitalise on gradual growth of household income in Georgia and low confidence in recycled tissue with the general population. Our brand Orei offers high quality product attractively packaged and competitively priced,” he says. 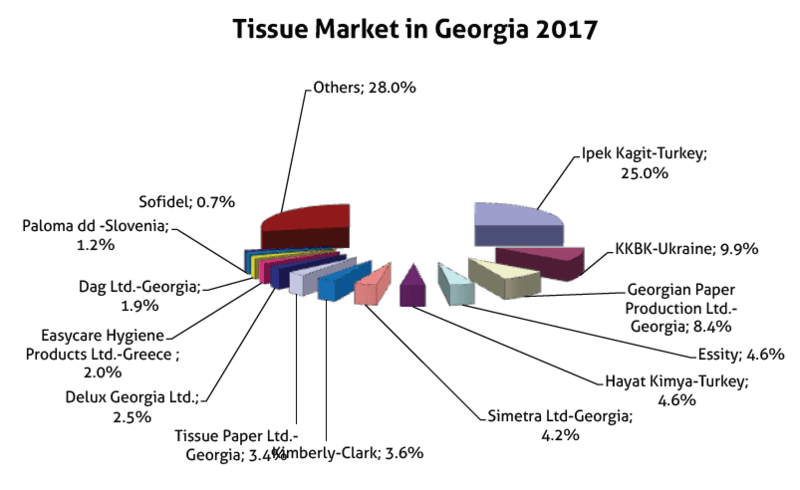 Three more companies with a presence in the Georgian tissue market should be cited. Georgian companies Georgian Paper Production (brand Elfi), Dag (brand Eco-nomy) and Delux (brand Luxpak) over the last five years significantly reduced their market presence in the recycled category to 8.4%, 1.9%, and 2.5% respectively, reflecting current market demand shift from recycled to virgin tissue. Over the past decade, the number of international visitors including tourists has been rising in Georgia. There could be several aspects of this gradual growth: positive trend in relationships with neighbouring countries despite former wars, low cost of living, low crime, excellent local cuisine and traditional hospitality. This trend increases AfH tissue sales and commences growth of the HoReCa (Hotels/Restaurants/Cafes) food industry segment. 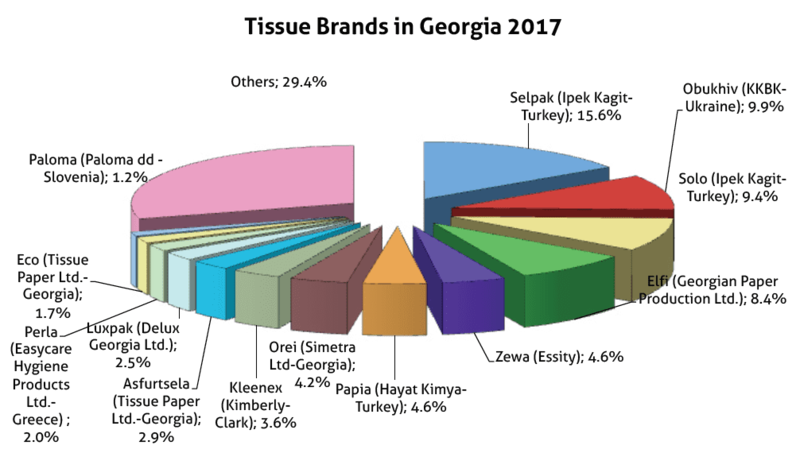 In Georgia, rising demand in AfH tissue products is also driving up consumption of retail tissue as well. HoReCa rise is a quite recent phenomena in the country where for the last five years the largest international hotel chains opened several four and five star hotels in major cities and resorts. Demand is being driven not only by premium hotels, but also state organisations and industrial businesses. With growing financing for tissue goods almost all HoReCa participants prefer to choose international brands which dominate sales in this area due to their offering higher quality, low prices and ability to maintain a constant supply of goods without interruptions. However, in recent years a number of small local tissue converters (Simetra, Kriala, LMS, Dag and Mzchetis Kagaldi) begin to enter AfH area offering competitive bids. 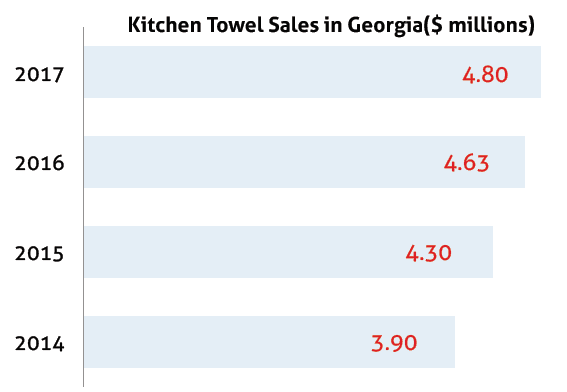 In 2017 AfH paper towels remain the most popular tissue product in Georgia’s foodservice outlets posting about 46% of the overall sales. According to Euromonitor International, the AfH tissue segment in Georgia reached about 1,300 tonnes in 2017 with net sales growth of about 51% from $1.18m in 2012 to $1.78m in 2017. Projected AfH sales amount for the 2017-2022 period shows increase of 41.8% reaching $2.52m in 2022. AfH paper towels expected to continue posting growth over this period showing 45.7% increase. Share the post "Georgia – rising tissue market in Caucasus Mountains"